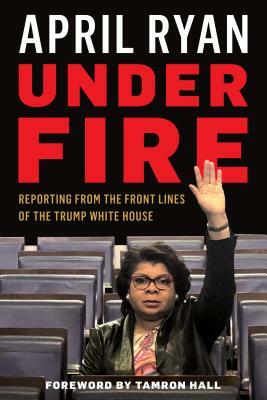 Veteran White House reporter April Ryan thought she had seen everything in her two decades as a White House correspondent. And then came the Trump administration. In Under Fire, Ryan takes us inside the confusion and chaos of the Trump White House to understand how she and other reporters adjusted to the new normal. She takes us inside the policy debates, the revolving door of personnel appointments, and what it is like when she, as a reporter asking difficult questions, finds herself in the spotlight, becoming part of the story. With the world on edge and a country grappling with a new controversy almost daily, Ryan gives readers a glimpse into current events from her perspective, not only from inside the briefing room but also as a target of those who want to avoid answering probing questions. After reading her new book, readers will have an unprecedented inside view of the Trump White House and what it is like to be a reporter Under Fire. April Ryan has been a White House correspondent for the American Urban Radio Networks since the Clinton administration. In addition she can be seen almost daily as a political analyst for CNN. She has been featured in Vogue, Cosmopolitan, and Elle magazines as well as the New York Times, Washington Post, and Politico, to name a few, and has appeared on The Late Show with Stephen Colbert, Anderson Cooper 360, Hardball, Meet the Press, and many other television news programs. She is the 2017 National Association of Black Journalists Journalist of the Year. She is also a 2019 Freedom of the Press Award Winner for 2019 by The Reporters Committee for Freedom of the Press. Ryan resides in Baltimore, Maryland.